Doreen Fishkin was one of the first volunteers to sign up for the “Kibbitz and Ride” volunteer driver program when it started in March, 1999. When her mother was alive, Doreen would drive her everywhere. “I like to think that I’m doing the same for someone else’s mother.” Doreen has said that she knows she makes a difference in the lives of agency clients. “They would be homebound.” She has taken people to the supermarket, beauty parlor, flea market, bereavement groups and congregate meal programs. Every Monday, she drives a 96 year old client to the Diamond Club, a social club for those over the age of 75, so that the client can continue her own volunteer work there. 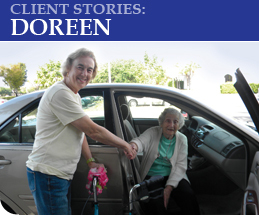 Over the past 12 years, Doreen has provided hundreds of rides for clients. Volunteers are a critical component of many of our programs and we would not be able to provide many of our services without their gift of time and talent. Volunteers mentor children and teens, lead religious services at assisted living facilities and nursing homes, visit the sick in hospitals, provide rides for seniors in need of transportation and reduce the isolation of the homebound through daily telephone calls and friendly visits. A variety of opportunities are available depending upon your interest and skills. Computer literacy preferred. Spend time in nursing homes, assisted/independent living facilities and hospitals conducting Shabbat Services and/or visiting unaffiliated Jewish patients. Schedules arranged with the facilities. Help the frail elderly by assisting them in formulating questions to ask their doctor, accompanying them to the visit and then ensuring that they understand what was said to them. Create your own weekly schedule. Volunteers are very much appreciated at this Monday morning social club for seniors (75 years or older). Opportunities include registering members, helping in the kitchen with late morning refreshments or assisting members with craft projects that are then donated to hospitals and other needy organizations. Meet with an isolated homebound senior in our community for one to two hours per week for socialization and conversation. Assist with our monthly food baggings or help deliver food to needy residents in our community. Our Kibbitz and Ride Transportation Program is a vital part of our community. We drive seniors who cannot drive to medical appointments, food shopping, and other errands, which are arranged in advance. Not only is this a driving program, but the time the driver spends with the clients gives them companionship, conversation, and may be the only person they see that day. Our drivers are volunteers and are reimbursed for mileage. 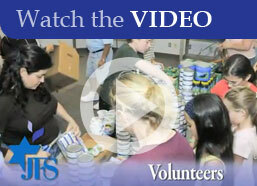 If you are someone looking to volunteer and who wants to give back to your community, consider JFS Kibbitz and Ride. Background checks are done on drivers and a clear motor vehicle driving history is required. Monthly training/supervision meetings are an integral part of volunteer service. Contact 561-852-3333 for further information on being a part of this vital service. Consider volunteering to teach a class, or help with special events and programs at this new state of the art facility. Volunteers also serve light meals in the cafe', greet visitors, provide tours and register attendees for classes. Volunteer as a special phone friend to a homebound senior by making calls once a week for two hours from our Delray Community Center.